It seems like there are two kinds of people in the world: those who love Christmas in July and those who don’t really care. I’ll be the first to admit that I’ve always fallen firmly in the latter camp. I mean, I love Christmas…at Christmastime. Until a few years ago, I was also not one to read Christmas books and watch Christmas movies. The whole Hallmark Channel Christmas movie thing? Completely lost on me. So it probably won’t surprise you that I’m now tentatively dipping my toe into the whole Christmas in July idea. (Because really, another chance to put on a much-loved movie shouldn’t be avoided lightly!) And in this case, that toe-dipping can benefit you (if you act fast)! Today is the last day of a special promotion for Christmas in July. We’ve rounded up 40 different Christmas books — and they’re each just 99 cents. You may have read some of them already, but I’m guessing there are some new-to-you delights still to be found. For the last ten years, disaster has struck on Christmas Eve, leaving Tori dreading the holidays. When she’s assigned to cover the light displays for her newspaper, she’s determined to spend as little time on the article as possible. Especially once she realizes she’s to feature frat boy Gabe “The Babe” Robertson, her former college crush. Gabe Robertson is a different man than he was in college. Every December, he transforms his acreage into a winter wonderland designed to celebrate the birth of Christ and share God’s love with the community. He also uses the lights to raise money for Operation Mistletoe, an organization that sends Christmas to troops stationed overseas. Unable to set aside her prejudice, Tori looks for ulterior motives in Gabe’s actions and determines to dig deeper. Will her investigations destroy any chance of a Merry Christmas? Do you have a favorite Christmas movie? I’d love to hear about it in the comments — there’s probably something for me to add to my list! Hi Elizabeth! My favorite Chrismas movies are White Christmas and Meet Me in St. Louis. I watch both every year. White Christmas is a big favorite of mine, too. My boys always sit and make fun of me singing along :) I guess we all enjoyed the movie in different ways, right? We don’t do a lot of Christmas movies in our house but it sounds like a good tradition to start! They can be a fun thing on chilly evenings for sure. And so many are family friendly, it’s nice not to have to worry. Hi Elizabeth. Interesting post- here in Australia, July is winter- so it most resembles the ‘typical’ Christmas weather depicted in most books/movies. Christmas in Australia- is summer. And I love it, even though it makes no sense to have Christmas lights (it doesn’t get dark until just after 9pm) and other Northern hemisphere traditions. I enjoy reading Christmas stories, have to confess I have not really gotten into Christmas movies, except for my favourite, a classic Australian Christmas movie called Bushfire Moon. I have a good friend in New Zealand and she also lives having Christmas in summer. It would be an adjustment for me, for sure. We’ve been in Florida a few times over Christmas, and 80 degrees is simply too warm for me to wrap my brain around. I suspect I’d adjust, but when it’s not the usual, it stands out :) Of course, we don’t always (or even usually) get snow where I live, but it is at least usually cool. I love to watch The Holiday and all of the movies on the Hallmark channel. Hi Elizabeth, I really enjoyed Operation Mistletoe (and some of the others in the series). I still would rather read Christmas books around Christmas time (same for movies though I’ve never really cared about the movies). I’ve recently been wanting to watch Father Christmas (Hallmark’s recent release), because I enjoyed the book. I’m so glad you enjoyed it! I generally agree about keeping Christmas to Christmas time. But sometimes it’s fun to sneak one in off season. If I’m really in the mood, then definitely it’s fun to watch it out of season..
Also I got the name of the movie wrong.. it’s Finding Father Christmas. Oh that sounds interesting – good title. I’ll have to look it up! A Christmas Carol with Alastair Sim. ~And here’s a really obscure one from 1991, Miracle in the Wilderness, with Kris Kristofferson and Kim Cattrall, an 1850’s couple and their baby kidnaped by the Blackfeet Indians. They then get an opportunity to share the story of Jesus with the Indians in a way they can understand and accept, really touching! -I’ve read 11 of the 41 books in the July special, must go pick up some more, I’ll read a Christmas book any time of the year! Miracle on 34th Street is the only one I’ve seen. I’ll have to see if I can find those others sometime. Hi Elizabeth! I really enjoy watching Hallmark Christmas movies in July. Especially the 2016 releases, since I haven’t memorized them yet, like The Christmas Card. I usually leave the holiday reading for late fall and winter, when all the new stories come out. I have probably read at least 10 of the Christmas in July releases, including Operation Mistletoe. Most of the stories I read, where in a boxed set. With so much to read and so little time, I do not reread stories, even though I rewatch movies. Maybe because while I am rewatching movies, I often read. Best wishes on your release. Hi I am one of those people that love Christmas books and music all year long. My favorite song is “Mary Did You Know?” by Mark Lowry. Some of my favoarite Christmas books are “The Christmas Shoes” by Leonard Ahlstrom (with CD) and one by Donna VanLiere. And then there is “The Polar Express” and of course I love to read inspirational romance Christmas books also. I put your book on my Christmas list. My favorite Christmas movies are The Muppet Christmas Carol, While You Were Sleeping, and White Christmas! Those are all wonderful choices! I tend to like the older Christmas movies (Miracle on 34th Street), however, I do enjoy the Hallmark movies each year! I am an avid reader so really like to read Christmas stories!! Hi Elizabeth! Great post! I’m not a huge fan of Christmas in July but you definitely have me rethinking it, lol. I don’t really have a favorite Christmas movie (too many choices!) but last year I discovered a new movie on Feeln. It’s called, “If You Believe” and it’s about a book publisher (Ally Walker) who has lost her love for life. After she hits her head she is visited by a little girl (Hayden Panettiere), who claims to be her inner child. Really cute movie! 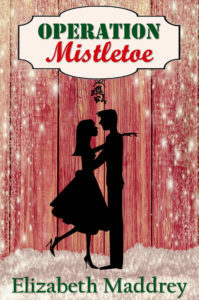 Adding Operation Mistletoe to my TBR list. Sounds great! Oh…that sounds like a cute movie! I’ll have to look for it. Hope you enjoy Operation Mistletoe! The past few years, I’ve been writing Christmas novels or novellas in July and August, so it’s fun to share the summer Christmas spirit with others! I’ve read over half of the stories in the Christmas in July 99-cent promotion and went shopping yesterday to pick up several more. I probably won’t read them until later in the fall, though! Miracle on 34th Street. Old and new versions are both great. I haven’t seen The Preacher’s Wife (or The Bishop’s Wife) I don’t think. And I’ll be the first to admit, somewhat sheepishly, that I really dislike It’s a Wonderful Life. I know. I’m bad. Elizabeth, I thought I was one of the few on the planet who doesn’t like It’s A Wonderful Life (and it’s one of my husband’s favorites). I think he had a boyhood crush on Donna Reed, so I’m sure that had something to do with why he likes it. :) I just don’t care for it although I’m not really sure why. Then again, I don’t like A Christmas Story, either, and the rest of my family does. Oh yay! We can be buddies :) I can’t put my finger on why I dislike it either. And I can watch A Christmas Story because my husband loves it, but it’s not a super favorite of mine. I’m not a fan of It’s a Wonderful Life either. I saw it once and that was enough for me. I LOVE writing Christmas stories, I wish I had more time to read other authors’ Christmas stories! There are so many in the promo I’d like to read. We have a tradition in our house (no kids!) of watching A Christmas Carol every Christmas Eve. Though I also love the old Alistair Sims one, the one we prefer is the version with the actor who played Captain Picard in Star Trek- the Next Generation as Scrooge. I didn’t realize Patrick Stewart had done A Christmas Carol. I have an audio book of him reading it, which is a delight, though. I’ll have to hunt that up. One of my favorite authors, not Christian per se, but she writes basically clean, Sheila Roberts has a Hallmark/Lifetime movie based on her novel “On Strike for Christmas”. Sheila writes humorous heartwarming stories similar to Debbie Macomber. We have to watch National Lampoon’s Christmas Vacation every year! It’s a tradition. Christmas Vacation is hilarious and a big hit for me and my hubby. The kids aren’t *quite* old enough to enjoy it with us. I think I may have seen On Strike for Christmas and enjoyed it. It sounds familiar at least. My favorite is “A Christmas Story”. I always watch it with my family on Thanksgiving night and quote my way through it. That being said, the one Hallmark movie I do love (and it recently re-ran a couple of weeks ago) is A December Bride based off of Denise Hunter’s book. I love her writing in the first place and the movie brings it to life. You can even catch a glimpse of her and her husband towards the end! Three classic movies I try to catch every year at Christmas; It’s a Wonderful Life, George C. Scott’s A Christmas Carol, White Christmas, Miracle on 34th Street, and The Grinch Who Stole Christmas (animated). The other favorite but harder to catch on TV, The Muppet Christmas Carol.